105 Main Street, Gorbals, Glasgow. 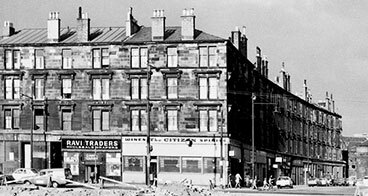 Main Street, Gorbals became known as Gorbals Street. In 1895 George Scott and manager Alexander Mitchell took over this old pub, The Garrick, which was situated at the corner of Main Street, Gorbals and Rutherglen Road. Mr Scott was born in the village of Longniddry, East Lothian and moved with his parents to Tranent, here he attended school. On leaving his education at an early age he entered into the licensed trade there before moving to Leith. In 1869 he began his long service with Rutherford’s, Jamaica Street working his way up to manager, he stayed with the firm for the long period of twelve years. The Citizen Bar 1960s. Thanks to Norrie McNamee for the image. Mr Scott was an enthusiastic ornithologist and was one of the best judges of canaries in the country, he won prizes for his birds in both Scotland and Ireland. He loved to play bowls and curling and was a crack shot. He was probably best known for his interest in horticulture, in 1903 he won first prize and four second prizes for his plot in Hutchesontown Gardens, his garden plot was specially photographed for the Gradeners Journal. His eldest son supervised in the Garrick in the early part of the 1900s. Mr Scott took on manager Alexander Mitchell, the two of them worked together in Rutherford’s and were great friends. Mr Mitchell a native of the West Highlands came from Ormidale, his father was a factor and manager for Mrs Campbell who owned the Ormidale estate a beautiful part in the Kyle of Bute. His father left the estate and moved to Paisley where he acquired licensed premises in Gilmour Street formerly held by Thomas Blair. Young Alex received his education at a private school known as Watson’s, after leaving he assisted his father in his new venture in a pub on Govan Road the “Kyles of Bute” wine and spirit cellar. Alex left his father to work on the ships, becoming steward. He then joined the staff at Rutherford’s where he met his long life friend Mr Scott. A well known blend of Scotch whisky was sold on in the Garrick No.4, costing 10d a gill. 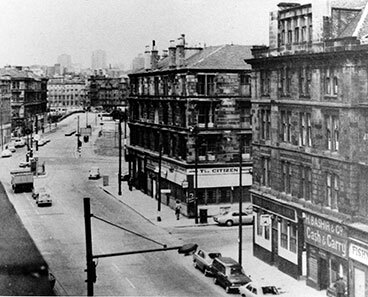 Looking along Gorbals Street with both the Citizen Bar and the Seaforth Bar. Thanks to Norrie McNamee for the image. Mr Scott acquired another establishment on Pollokshaws Road now called the Allison Arms. He when bankrupt in 1912. George Banks the took over the Garrick and continued as licensee until the end of the First World War. Another well known publican to hold the licence was Charles Sweeney, many southside locals will still remember Mr Sweeney who took over the pub in 1958, he ran the business until it was demolished in the 1970s. The pub will still be remembered as the Citizen’s Bar. Gorbals Ward dinner dance of the Glasgow and District Licensed Trade Defence Association. 1971. Included in this photograph are Mrs & Mrs Frank Munro, Mr & Mrs C Sweeney, Mr Alex R D Anderson, editor of the National Guardian, George Ramster, Michael Heraghty, George Grier, I G Donaldson, Samuel Falconer. Good days bowling 1974. H Gallagher, R McCrudden, C Sweeney, E O’Doherty, W McCann, W Coggans, A Jordon, C Duncan. The Citizen’s Bar wins the Guinness Darts Shield for the fourth time, beating the Ceilidh Bar, Clyde Street in the final, Mr Charles Sweeney, Mr W Martin, captain, Bob Connolly, area representative, Guinness, G McGinlay, Ceilidh captain and J A Baillie, assistant regional manager for Guinness. 1972. The Guinness darts shield 1968. The Tron Bar was runners up. Left to right Mr J Reynolds, Tron Bar, Mr Larrie King, Citizen’s Bar team captain, Mr Jimmy Reynolds no relation to the other Mr Reynolds who was captain of the Tron Bar team, J A Baillie, Guinness and Mr Charles Sweeney. Members of the Gorbals Ward Licensed Trade Association 1965. Back row J Thom, J Heraghty, N Douglas, C Sweeney, J K Webster. Front row P McGovern, H Gallagher, S Falconer, R McCrudden. Gorbals Ward Licensed Trade Association 1965. Left to right Mr & Mrs J Rogers, Alamo, Mr & Mrs A Ferry, Alamo, Mr Charles Sweeney, Mrs & Mr Bright, Citizen’s Bar. A Gorbals Licensed Trade function 1968. 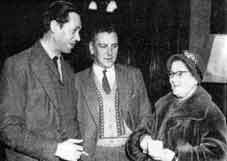 Left to right Mr & Mrs Charles Sweeney, Mr & Mrs J Thom, Thom’s Bar, Mr F B Munro, Cutty Sark. Gorbals night out 1974. left to right G H Ramster, Mrs Ramster, H Gallagher, Mrs Gallagher, Mrs Sweeney, Mr C Sweeney, Mrs Munro, Frank Munro. The Citizen’s Bar wins the Cutty Sark darts competition 1967, F Munro, Cutty Sark congratulates Charlie Sweeney and his team. Below is the runners up Mr Munro congratulates Mr Hugh Gallagher and his team, Tirconnail Bar. 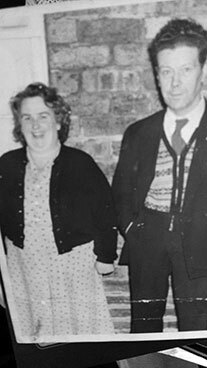 Mr James McKell of the Turf Bar, George Ramster and Mrs Forester. 1959. Cathy and Thomas Kelly owners of the New Era Bar. 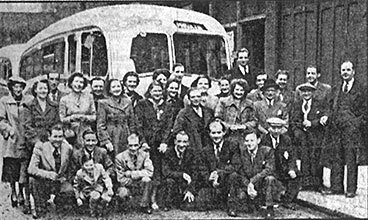 Bus run from the New Era Bar, locals and John Scanlan the owner in the centre of the image. 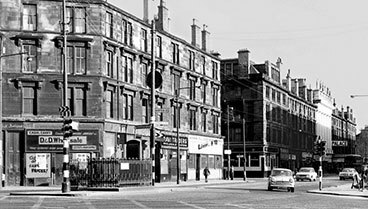 Looking along Gorbals Street north with the Seaforth Bar and the Citizen Bar on the other corner. The Citizen from Rutherglen Road. Manager of the Garrick, Alexander Mitchell.